The proliferation of technology can create dangerous distractions in the operating room. Two UCF experts discuss the risks, research and solutions to the potentially deadly situation. As the proliferation of technology continues to profoundly impact our daily lives in many positive ways, we also need to recognize its detrimental effects — even in the hospital operating room (OR). The dark side of OR technology and the overload it creates can range from mild user frustration to patients’ deaths. In 2007, a Chicago man died under the precise “hands” of a surgical robot manned by a surgeon who had never operated the equipment on a living subject. This tragic event illustrates the darkest side of health information technologies (HIT), which include medical devices that support health care professionals. The ensuing multimillion-dollar lawsuit from the 2007 malpractice partially laid the blame on the overconfident surgeon who had been inadequately trained. Yet this surgeon operated in a health care environment that does not require certification to operate the extremely complex equipment that is finding its way into modern ORs around the country. The Computer Journal estimates that a surgeon needs to perform 200 to 750 operations using a robotic surgical system to be considered proficient in that system. Although the benefits of robot-assisted surgery may be great, the research I have done with my Dutch academic colleagues, Anne Rutkowski of the Delft University of Technology and Jon Pluyter of Tilburg University, has focused instead on HIT’s dark side, especially sensory overload from OR technology. Equipment in the OR emits an amazing amount of visual information and sounds. A recent New York Times article noted that electronic monitors in one hospital’s five intensive care units produced more than 2.5 million alerts in a single month. To make things worse, standards for the equipment are deficient to the extent that a sound emitted by one piece of equipment may signify that all is well, while a similar sound on another machine is an alarm demanding immediate action. Alarms were rated as the No. 1 health technology hazard from 2012 to 2015, according to the ECRI Institute. My colleagues are working with a professor of health care safety at a Dutch hospital to devise ways to train medical interns and residents in new OR technologies. We are studying a team-based training approach that is similar in concept to what is used to train airline flight crews. Members of surgical teams need to understand and respect each other’s roles in order to work well together. To assess the effectiveness of the proposed training regimen for laparoscopic surgery, we used a thermal imaging camera to visually capture the facial skin temperatures of the residents performing the surgery. We had hoped the thermal imaging camera could assess the overload of residents training with virtual reality simulator platforms designed for laparoscopic surgery. Indeed, the residents who performed very poorly on the surgery reported feeling overloaded, and the temperatures around their eyes were significantly higher than those of residents performing very well on the surgery. Interestingly, the temperatures of the residents performing exceptionally well were also very high — but in their foreheads, and those residents did not report feeling overloaded. We believe that they were cognitively absorbed in their tasks and found the laparoscopic surgery to be pleasantly challenging. Medical errors in the U.S. cost an estimated $3.5 billion annually, according to a study published in the Information Systems Research journal. More than half of health care errors (51.7 percent) are related to surgery, and these errors may lead to disability (5.5 percent) or even death (6.2 percent), as noted in the Quality & Safety in Health Care journal. Though our findings are preliminary, they suggest that HIT in the OR can have drawbacks. If medical team members are not well-trained in a technology, they can endanger patient safety. In the hands of an overconfident, inadequately trained surgeon, HIT can result in injury or death. To reduce the potential hazards of the use of HIT in the OR, it is important to train medical personnel both individually and in teams. In addition, patient safety could be enhanced if certification is required to operate complex HIT, and standards for alarms and displays for OR equipment is established and implemented. 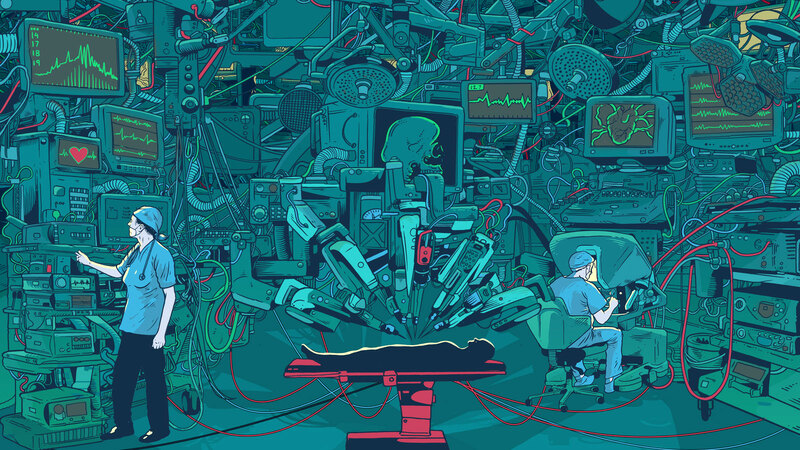 Research has suggested a number of concerns related to the presence of, and reliance on, advanced technologies in the medical environment — specifically, in the OR. As a surgeon, my clinical practice coincided with a great expansion of OR technologies. The miniaturization of image- processing devices allowed for the development of minimally invasive operating techniques that could be performed using altered standard instruments (e.g., scissors made small enough to fit in a tiny wound) or remarkably complex platforms like the surgical robot. These technological advances have led to a reconsideration of the risk-benefit analysis for every revised procedure — and the process has not been easy. The concern for me has not been the technology itself but, rather, in the training of the end user and the nuanced development of judgment related to the use of the technology. It has been customary practice for a surgical device manufacturer to develop a new tool, market it to the user, and train the user in some sort of workshop or seminar, thereby clearing the road for its use in patients. This type of training does not generally test for competence and typically does not assess the judgment of the user. Instead the sessions tend to focus on confirming that the clinician can utilize the instrument. Although that is an important outcome of the manufacturer-provided education, the more important discussion should center on questions such as: Given this new instrument’s capabilities, what would you do if it misfired? How would you handle the complication of this instrument not turning off ? What if the instrument was stuck inside the patient? These types of questions are not frequently addressed when a new device or instrument is first presented to the medical community; the issues only become evident after there are complications once it is in use. Competence and judgment are much harder to assess than attendance at a weekend symposium. I agree that in the hands of a poorly trained surgeon HIT can lead to catastrophic consequences, much like a poorly trained pilot could place many individuals in simultaneous peril. The medical community has drawn many analogies to the airline safety movement in the past and, although many are appropriate, the surgical environment has its nuances. A number of well-meaning efforts to incorporate checklists and other airline industry standards in the OR have proven to simply be added bureaucracy. The overall improvement in patient outcomes has been difficult to ascertain and many checklist boards sit unfilled in our operating rooms. Team training has also received a lot of attention and, in many cases, is absolutely critical. We see the positive impact of team training in cases where complex and specialized equipment is used, for example, in procedures requiring cardiopulmonary bypass. In these cases, many individuals with specific training must work in a highly synchronized series of steps to carry out a procedure, and in cases of unanticipated complication they must be able to troubleshoot together. Technology is generally not the problem. Training metrics must be developed that assess the ability to apply clinical judgment to the use of a device along with competence in its use, and comparisons or models of training in other complex systems should inform OR/HIT training. This training should not be left to the equipment manufacturer alone. The market drive in our medical system has led to a tremendous revolution in technology that has been useful, but it has at times been delivered to end users prematurely.